Hey everyone, this is my first post on crimson daggers! I quit my day job about a year ago to focus on my true passion. I use traditional media to paint and draw, and I am hoping to find some constructive input on my art so that I can improve. Here is one I am about finished with currently. It's 32"x18" oil on canvas. I am new to this and a bit shy, but I can take constructive criticism, so have at it! Hey welcome to the forums. This looks great! It seems the highlights on her right leg and lower abdomen are too large and strong, which flattens the forms. Personally I feel that the white floor/lower background creates too much contrast and takes attention away from the face/main focal area. Perhaps making it blend in with the top half with more red and orange could be an idea. Keep up the great work, looking forward to see what else you post! (04-12-2019, 04:17 PM)ubem Wrote: Hey welcome to the forums. This looks great! It seems the highlights on her right leg and lower abdomen are too large and strong, which flattens the forms. Personally I feel that the white floor/lower background creates too much contrast and takes attention away from the face/main focal area. Perhaps making it blend in with the top half with more red and orange could be an idea. Keep up the great work, looking forward to see what else you post! Thank you, I appreciate the advice and I will make those changes! I am pretty new to oil painting so I'm hoping I can pull off blending in the new background area with the rest now that it's dry. I have very little experience with backgrounds and painting/color in general and I'd like to get better at creating depth and using light and colors consistently. I really enjoy your work, you use light and color masterfully and your brush strokes are very successful! I see strengths in your work that I'd like to move toward so I really appreciate your critique. Here are a couple more oil paintings. With the portrait, I am unsure if the background is working successfully. Should I be adding more skin tones, or is the blue good? With the torso I was trying to play with adding colors to convey emotion. Here it is with some updates. I think it looks like she is floating and I am not exactly sure how to make it look like she is standing in the background. 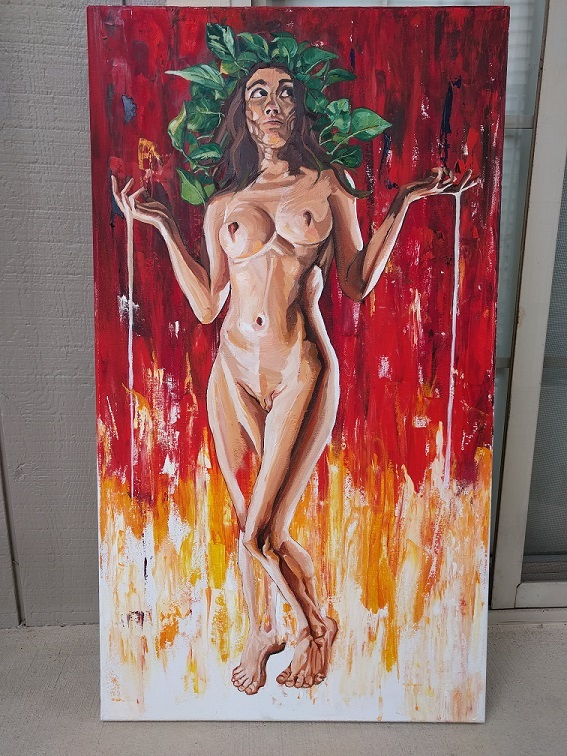 I was thinking maybe some lighter yellow under her feet in a horizontal direction, but I am not sure. Making the figure look like it's physically in the background is something I struggle with. (04-14-2019, 09:05 AM)Nikelart Wrote: Here it is with some updates. I think it looks like she is floating and I am not exactly sure how to make it look like she is standing in the background. I was thinking maybe some lighter yellow under her feet in a horizontal direction, but I am not sure. Making the figure look like it's physically in the background is something I struggle with. You need to show your “planes” of background, where is ground and where is back. That is why, different planes — different values. Think about the cube. Have you ever drawn a cube or painted it? The principle will be the same, but I’m confused because of you light sources and can’t understand how many of them there are and from where they are going. So, FOR EXAMPLE ONLY, your floor could be lighter than the area behind her back. Also adding shadows beneath her feet and body is crucial for “grounding figure” into the floor. As for my comment of “shadows are too dark and light too white” take a look at Sargent or bougreau: they have the color both in light areas and in the shadows and transition is far more subtle. Also even highlight has a subtle color (in painting of course, because in real life’s the highlight is pure white, but since pigment colors are far away from the colors of light painters add a tiny amount of tone into highlight to harmonize the painting). Thank you so much for the constructive feedback, I think that what you are seeing is going to really help me improve! I will think about and work on these problems I'm having. with your initial naked girl, youre doing a lot of things very well, like her body is pretty nice, and her hands are not bad; her eyes feel cartoony as theyre pure white, in reality they might be darker, but its not necessarily wrong so to speak. her stance feels strange to me, both feet are on tip toes, but shes not standing on anything, which you could make the case that shes floating, but her legs have some proportion issues. Typically the calve is about the same length as the thigh. i want you to imagine her leg thats forward, going back to the same position the other leg is in straightened. that leg would be 1.5X longer than the other in the thigh area. Also if both her feet are tiptoed, they almost are not on the same plane, so the size difference is strange. Now again youve shown a lot of advanced things here, im seeing gastrocnemius indication, you know nice patella, nice planes on the face, but the feet are lagging behind. The foot on the longer leg feels like its missing a little bit of length and the other foot feels amateur and out of place compared to the very nice anatomy on the rest of the body. The background clashes with the green leaves on her head. 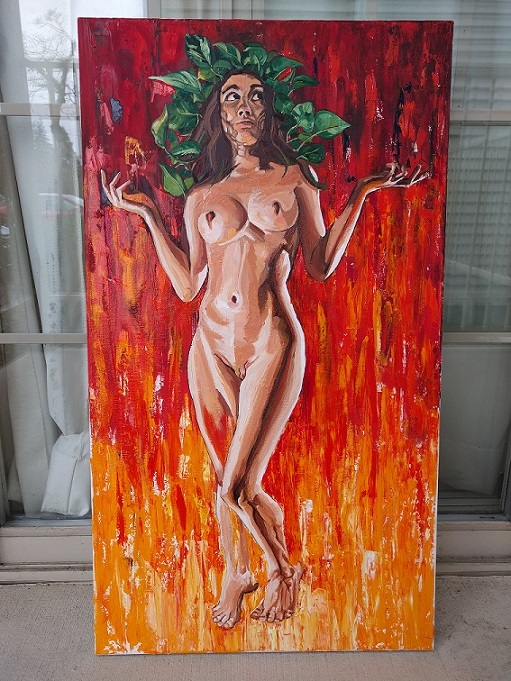 Is she in fire? why does she have a crown of leaves? an all black background might help things blend more, you have a ton of warm tones and very little control of the values in the background as the feet disappear and are unreadable from far away. Her head feels a tad big and some of her fingers like (her) right index finger has disappeared and im not buying that its behind the middle finger, and her left ring finger could use some lovin. (04-15-2019, 09:40 AM)Fedodika Wrote: with your initial naked girl, youre doing a lot of things very well, like her body is pretty nice, and her hands are not bad; her eyes feel cartoony as theyre pure white, in reality they might be darker, but its not necessarily wrong so to speak. Thank you very much for such a thorough critique, I really appreciate your time! I have make a lot of these changes, but i still have some work to do and I'll update when I've finished. 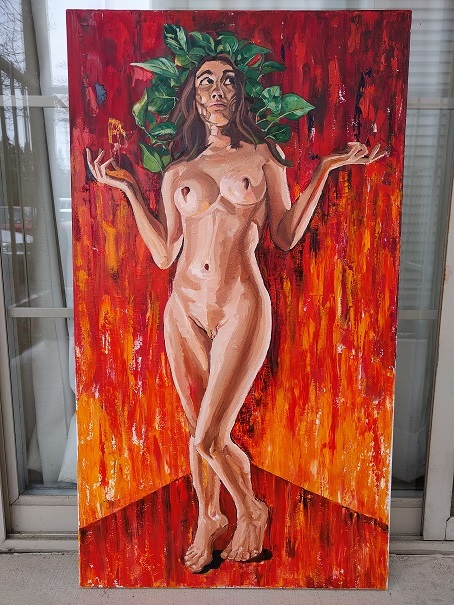 To answer your questions, my initial idea was that i wanted to show turmoil in most of the painting but have these lovely leaves at the top to kind of illustrate all of the struggle that happens in life, but that there is still beauty. It was a big project for me though and I'm not sure I'll be able to successfully pull it off. I am still learning how to use paint and I'm much better with portraits in which you don't have to worry so much about grounding XD. However, i have learned a *ton* making this thing and even more than I expected from the feedback I'm getting here! So I'll definitely keep updating and trying to improve. Alright, I have made some changes. I think maybe it's still too orange... 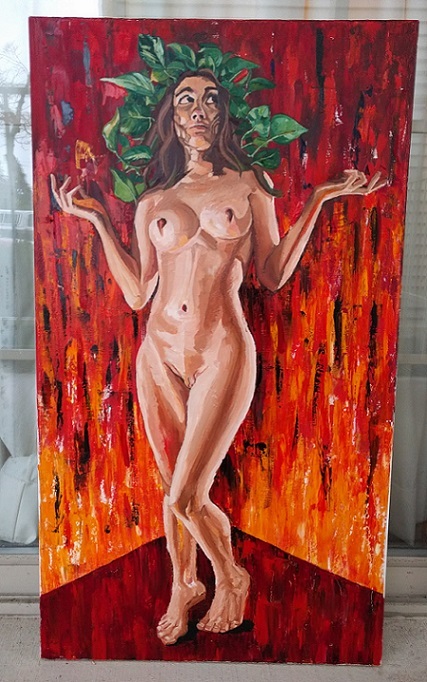 Her left hand is still wonky, and the feet are far from perfect. However, I am happier with it than I was previously. It may be time for me to start a new project for sanity, I have been staring at this one for far too long. Okay, so the orange was making me crazy and I immediately changed it. Whaddya think? (04-16-2019, 12:17 PM)Nikelart Wrote: Okay, so the orange was making me crazy and I immediately changed it. Whaddya think? I think it looks hella good though, especially sonce it's an actual painting. Current time: 04-20-2019, 03:12 PM Powered By MyBB, © 2002-2019 MyBB Group.